Get your creative fix at the start of a busy season! This month, you can create a Book Art Christmas Tree. Our special guest presenter is Karen Belmonte, Library Board Member and President of Friends of the Library. 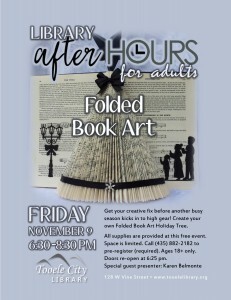 This Adults only activity will be full of fun, good conversation, and treats! All supplies provided. Adults 18+ only. Doors will open at 6:25 PM.